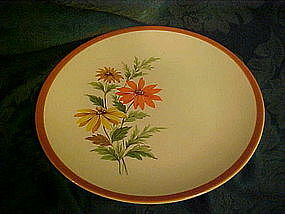 Retro 3 daisies pattern with a tan band by Homer Laughlin know as the Everglade pattern with a yellow and an orange daisy. They called this decorative procedure Dura Print. Some pieces are marked with a backstamp, some are not. It has the number 1970. Not sure if this was the date or the pattern number. Plate measures 10 1/4" in diameter and is in perfect condition. We have 16 available and all are excellent. Price is for each. We will also be listing the solid tan fruit bowls, cups & saucers to match.